DJ Ian Head drops his October 2009 mix entitled Good ‘Ol Soul (For Carlos), which is dedicated to Carlos Alvarez. Today Native Instruments ABSYNTH 5, GUITAR RIG 4 PRO, KONTAKT 4, and KOMPLETE 6 became officially available. 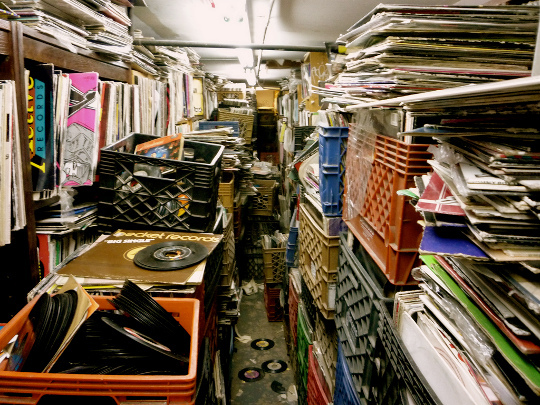 The New York Times tells the story of NYC’s distributor hosted Vinylmania event. Visually based record fiends can overdose on pics of sweet vinyl over at the Cratedigging Culture Flickr photo group. Producer Emile breaks down the making of Kid Cudi’s album. Argh, I hope that’s not his abused record collection. So many vinyl crimes being committed there. Well known digging spot. Sometimes, you’ll find gems.